The Oppo R11 Plus will go on sale on June 30. 6" FHD AMOLED display, 6GB of RAM, 64GB of storage, Snapdragon 660, 3880mAh battery. The Oppo R11 was released earlier this month to a flurry of media activity, a situation caused in part by its position as the first device to be powered by Qualcomm's game-changing Snapdragon 660. 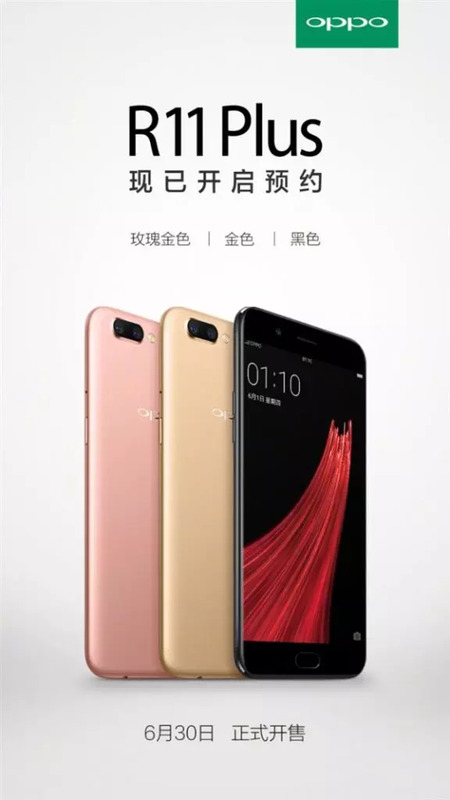 Oppos's latest release was launched alongside another device, though—the R11 Plus, which is just a larger variant of the standard R11, much like the name implies. A post by the company has slated the new R11 Plus to finally go on sale on June 30. The R11 Plus has a few distinguishing features from the standard R11; namely, display size, battery capacity, and RAM. The R11 Plus sports a 6" FHD AMOLED display—a bit larger than the 5.5" on the R11. It also ships with 6GB of RAM instead of the 4GB on the R11, and a 3880mAh battery that's also more impressive than the 3000mAh one on the R11. Both devices are, as previously mentioned, powered by the Snapdragon 660. They also both feature 64GB of storage, dual rear cameras (20MP+16MP), and a 20MP selfie shooter. The R11 Plus will be available in three colors—Black, Rose Gold, and Gold. It's expected to retail with a price tag in the region of $540.